Just over 200 km away from Ho Chi Minh City, Dak Nong is a popular heaven of waterfalls for many young Saigonese. Besides the familiar names such as Trinh Nu (Virgin) waterfall, famous Dray Sap waterfall ..., this place also makes you overwhelmed by the charming beauty of the Dak G'lun waterfall. The gorge falls at a height of over 50m and turns into two streams like two white threads hanging on a cliff. This beautiful scene is not in a strange place but in the land of Central Highlands, the home of the endless chorus. It is regrettable that travellers or lovers of the Central Highlands go to Dak Nong without visiting the Dak G'Lun waterfall. However, getting to Dak G'Lun is not easy if you follow the small path. This road is only for the adventurous to explore with high-rise locomotives on slippery rocks, crossing streams. Located on Dak R'Til commune, Tuy Duc district, 60 km from Gia Nghia town center, to reach Dak G'Lun waterfall, you can also follow the large road leading to the foot of the falls. From the distance, you are able to admire the beauty of the waterfall when it “hangs” itself on a height of more than 50 meters and turns into two streams hanging on the cliff, which looks very attractive. In order to get to this charming place, there are two options. From Gia Nghia town, visitors follow Highway 14 over 20 km along the direction of Ho Chi Minh City à go to the town of Kien Duc and turn right about 35 km along the provincial road 6 to Dak Buk So commune, Tuy Duc districtà turn left at the junction of Bai 2 and drive another 2 km to the internal road leading to the falls. The second direction is that from Gia Nghia town, tourists go along Highway 14 about 28 km toward Buon Me Thuot à turn left and go about another 32 km along provincial road 6 to Quang Tam commune, Tuy Duc district. Dak G'lun Waterfall appears as a mysterious watercolor painting. The water originates from a small stream that rises and falls down from a height of more than 50 meters. The foam is white, the water is like the rain. The overall look of the waterfall is like the long hair of a beautiful girl with pure rustic, innocent beauty. Another interesting thing that backpackers should not miss here is to conquer the journey from the top of the waterfall to the foot of the falls. Following the special forest with a variety of plants until when you hear the sound of flowing water, you will see a huge cave which can accommodate more than 100 people, this place is suitable for Camping overnight. Walking another short route, you will reach the foot of the falls to fully feel the majesty of "the beautiful girl of Dak G'lun. The people in the Central Highlands also called the Dak G'Lun Waterfall with another name, Chi (Thread) Waterfall. The streams of water from above pouring down are like white threads swinging all day and night, which makes the imaginary people think that it is a giant thread that the Creator made to connect the heaven and the earth. Coming to Dak G'Lun is synonymous with coming to the charming scene, cool fresh air with birds singing, which will bring you a feeling of relaxation, calm. Beside the waterfall are large, flat rocks with wide spread tapestries. Beneath the foot of the falls are large, small rocks with undulating yellow shapes like dances. When the sun rises, the sparkling water splashes into the rainbows creating magical scene. 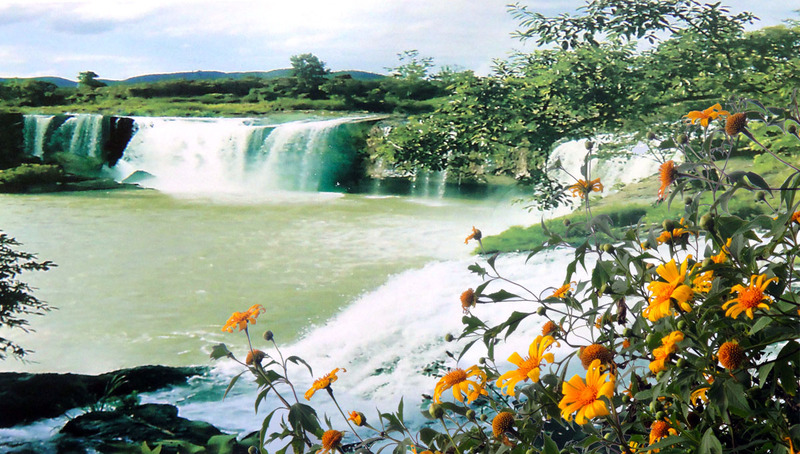 For many years, despite being located in the deserted place, with its wild and romantic beauty, Dak G'Lun waterfall has attracted many people to see the charm of this unforgettable pristine waterfall.